Much of the Midwest has been affected by a big spring storm that left flooding in Illinois. Residents in Gurnee, Ill., said it's the worst flooding they've seen in a decade and officials are warning it could be a week or two before flood levels significantly drop. NBC's John Yang report. A massive and deadly weather system carrying potentially severe thunderstorms, damaging winds and possibly even tornadoes was soaking the nation’s midsection on Thursday, with flash floods reported in Chicago and heavy rain expected to cause major flooding along the Mississippi River. The weather was said to be responsible for two deaths. Minnesota State Police say 16-year-old Jonathon Pohlen of Houlton, Wis., was killed Thursday afternoon when he lost control on snowy Interstate 94 in eastern Minnesota, crossed over the median and collided with a truck's trailer. The National Weather Service in Chanhassen says the storm could dump up to a foot of snow in northeastern Minnesota by Friday. Meanwhile, flash floods are being blamed for the death of an 80-year-old motorist south of St. Louis. Police in De Soto say the woman's car was swept Thursday off Highway E into Joachim Creek. And flooding in the Chicago area — with more than 4 inches of rain reported — closed major expressways and led the evacuations of residents stuck in flooded homes, apartments and a hospital. 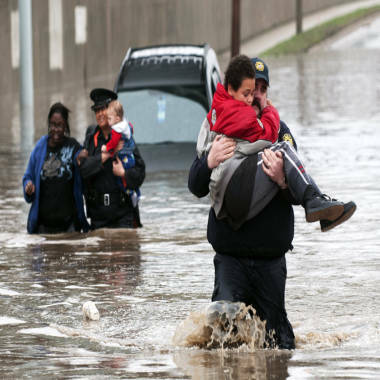 Firefighter Jason Kelley and police officer Shannon Vandenheuvel carry children from Barbara Jones' partially submerged car in Grand Rapids, Mich., on Thursday. The deluge caused a water main break on Chicago's South Side and the gushing water opened up a sinkhole that swallowed three cars. Parts of the Edens and Eisenhower expressways in Lake County, Ill., were closed in both directions at one point during the day, NBCChicago.com reported. Gov. Pat Quinn declared a state of emergency across Illinois as thousands of people struggled with flood damage even as another wave of wet weather was on the way. Quinn said a hospital in Morris, Ill., had to be evacuated and two trailer parks severely flooded. Residents living in The Towers at Four Lakes, a large apartment complex in a suburban area west of Chicago, were rescued from their flooded homes by boat, the DuPage County Sheriff's office said. NewsNation's Tamron Hall reports on the massive storm which called flash flooding in Chicago. Ajay Jha his wife Alo and daughter Aditi had to be evacuated through an open window of their home in Lisle by boat after a branch of the DuPage River overflowed. Illinois' governor warned people of the hazards of travel. "Heavy rainfall over the past few days has created dangerous flooding in areas across the state," Quinn said, NBCChicago.com reported. "Everyone should stay home and off the roads if possible. To ensure safety as these storms continue, people should be alert and avoid flooded areas." Residents were told to tune in to local TV and radio stations for updated information about any closed roadways or evacuations. Heavy rain caused a sinkhole in Chicago that swallowed three cars. NBCNews.com's Dara Brown reports. More than 500 flights were canceled at Chicago’s O’Hare Airport due to the extreme weather, and some trains were delayed. Air travelers were urged to check airline websites or call to confirm whether flights were still planned. In Midland, Mich., Northwood University canceled classes for the rest of the week because of flooding problems, NBC station WDIV reported. The Weather Channel's Greg Forbes, a severe weather expert, categorized the storm as a “major/massive flood event” for the Midwest. Flood watches and warnings were posted on Thursday stretching from northeastern Oklahoma to much of Missouri, northern and central Illinois, southern and central Wisconsin, and parts of Lower Michigan, Weather.com said. Flood warnings were issued in some cases for areas already swamped by melting snow. Seventeen gauges placed along the Mississippi River to monitor the rising water already showed major flooding, Forbes said, and the water was predicted to rise in the next 24 hours in Missouri, Iowa, Illinois, Wisconsin and Michigan. Indeed, the band of predicted extreme weather stretched from northern Michigan to Houston and the Texas coastal area. States along the Eastern Seaboard were set for heavy rain on Friday, Weather.com reported. The tornado risk, however, was expected to diminish as the storm moved east. Still, heavy rain was likely in Pennsylvania, New Jersey and the New York metropolitan area as well as the Atlantic Coast. A forecast issued late Wednesday by the National Weather Service showed a 40 percent chance that the Red River will top the 2009 record of just under 41 feet. Fargo City Administrator Pat Zavoral said he's confident the area will be protected. He said a forecast closer to 44 feet would have made things "a little dicey."